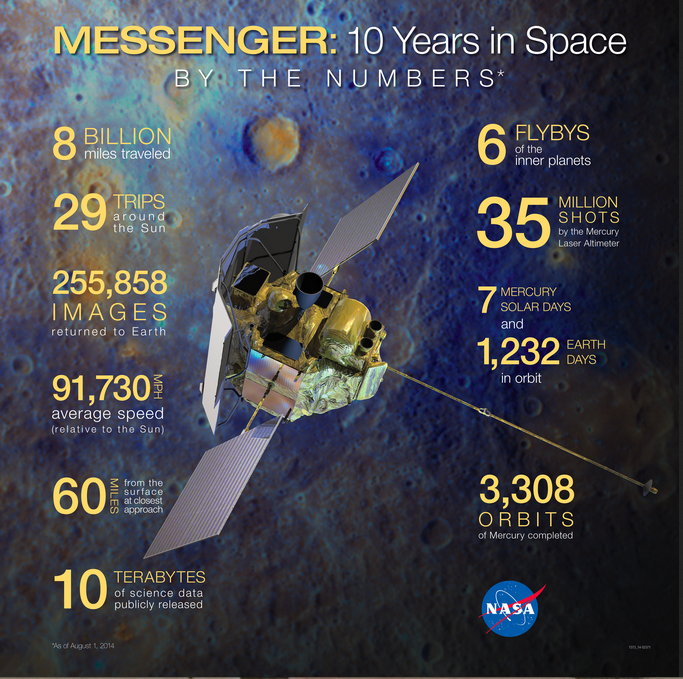 As NASA bid a fond farewell to its scrappy Messenger probe last month, the world was transfixed, not on the list of stunning scientific accomplishments over the past 10 years, but on the craft’s headline-grabbing, 8,700 mph crash landing into Mercury’s rugged terrain. While pandering to our collective inner Hulk, this Fast and Furious narrative – concocted by NASA and cloned by media outlets – effectively wiped any collective memory of why the pioneering spacecraft was built in the first place. This is nothing new – the mass media has been a delivery system of sensationalistic fixes for decades, providing little if no context to a story, leaving one shocked/entertained/titillated but ultimately uninformed. We hope that Galactic Sandbox will serve as a refuge from the storm and act as an online clearinghouse for all things space-related, including scientific, commercial, educational, cultural, and other far-flung realms. While it is impossible to provide complete coverage on the infinite scope of any one story, our goal is to point you in the right direction and send you off on a happy voyage of further discovery and adventure. The good news is the information is out there – we want to get you there as quickly as possible. * The revelation of large amounts of water in Mercury’s exosphere. * The eyebrow-raising discovery of carbon-containing organic compounds and water ice inside permanently-shadowed craters near Mercury’s north pole (possibly 2 miles deep). * Visual evidence of past volcanic activity, as well as evidence for a liquid iron planetary core. * Unexpected presence of high concentrations of Magnesium and calcium found on Mercury’s nightside. * Newly-named impact craters include ones named after Beatle John Lennon, author Truman Capote, and Italian tenor Enrico Caruso. * Postmortem data revealing Mercury’s magnetic field to be almost 4 billion years old. 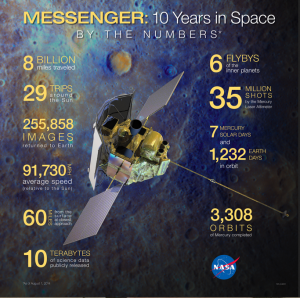 * Scientists will no doubt continue for years making further discoveries from the volumes of information provided by Messenger, including over a quarter of a million photographs and 10 terabytes of science data that have been publicly released.